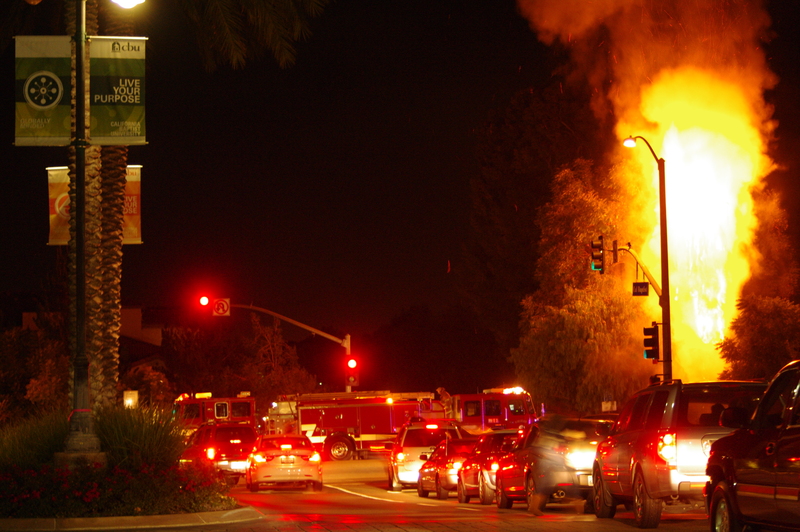 Photo by Jessica Bills- Fire engulfs a palm tree across the street from California Baptist University's main entrance. An inflamed palm tree, located across the street from the front entrance of the California Baptist University campus, shocked and awed student onlookers Thursday evening. The fire began at approximately 9:15 p.m. and was quickly contained by the Riverside County Fire Department. It is unknown at the time what started the fire. Battalion Chief Mitch Wefche said the fire was not caused by natural means and the case has been turned over to an investigator. The fire is believed to have started from the base of the tree, rather than from the top.